On July 4th 1976 I was just 10 years old. Many of my family traveled to a central Utah town of Richfield, where my cousins lived, to participate in the celebration of the big Bicentennial observance of our nations birth. There was a parade, of course, with lots of candy, a picnic in the park and, of course, the grand fireworks show that capped the day off. Two of my uncles brought the contraband firecrackers (still illegal in Utah) and bottle rockets (also still illegal in Utah). They set up two alluminum cans with a sparkler laying across like a bridge between them. 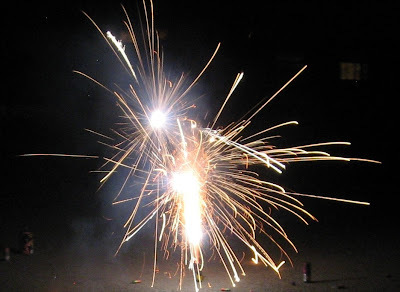 They then set up bottle rockets up against the sparkler...they lit one end and we watched them all shoot one or two at a time into the sky in rapid succession. In other years my parents would pile all the kids into the back of a pick up truck (open bed) with couch cushions for padding and set out for Salt Lake City to see the big fireworks display at the local ballpark. We had the best view as we sat in the back of the truck with the ballpark just across the street. Several years after I got married we invited my parents over for a holiday bbq. My dad brought a few empty 2 liter pop bottles and some dry ice. This, along with some water make up the ingredients for dry ice bombs. I repeat the account as I wrote it a couple years ago here at Paperclippings. Several years ago we had my parents over for a 4th of July picnic in our back yard. My Dad liked to make "dry ice bombs". These are made by using a 2-liter pop bottle, dry ice and water. Usually they go off sending the pop bottle several feet into the air. On this particluar day, one of the "bombs" failed to go off. This makes for a tricky situation as it still could go off at any time and so handling it is not very safe. (Note to anyone thinking of doing these: I believe they are illegal for this reason...well and they are considered an explosive.) If my Dad had been at home he would have pulled out his shot gun and diffused it in that manner. But we were at my house and the only thing my husband had of the kind was a sling shot with metal pellets. So, he pulls out his sling shot (wrist rocket), aims at the undiffused "dry ice bomb" and fires. The pellet flew from the wrist rocket, bounced off the dry ice bomb and flew back hitting my husband squarely in the forehead. He and my Dad made a trip to a medical facility and found that he did not need stitches. But upon being asked how this happened my Dad replied that my husband had been cleaning his sling shot when it went off. Since that time my pyro-technic [read maniac] husband has decided to keep it legal...with a twist. He mounts several rather noisy and colorful grounder fireworks onto a board and connects them with either cannon fuse or magic whips. He lights one end and sits back to watch it with the rest of us. But the 4th of July is more than just for blowing things up. Wow! That was pretty impressive! Hey Happy Late 4th from me too! Wanted to say Hi! It's been a while!